Clay Planet is a Premier Distributor of Peter Pugger Pugmills in California and nationwide. 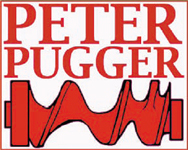 We offer all models of Peter Pugger, and can offer tips and advice on the model best suited for your needs. We also stock the Shimpo line of Pugmills, and are the Shimpo West coast stocking warehouse for Shimpo America. If you need a Pugmill, Clay Planet is your best bet! 1 HP Pugmill with optional vacuum for de-aired clay.